At least not directly. In order for a Like Campaign to bring revenue into your business, you have to have a strategy behind it. If not, you risk wasting your money. 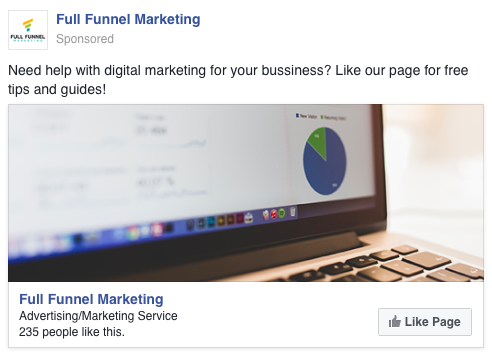 How Can a Facebook Like Campaign Bring Me Business? When someone “likes” your Facebook Page, that person is showing interest in your business. Think of it as a lighter step before someone signs up for your newsletter or email list. When someone “likes” your Page, the individual is subscribing to receive occasional updates on your business in the form of Facebook posts. Once people “Like” your page, they have officially shown interest in your business and have identified themselves as potential “warm” leads by knowing who you are and what you do. At Full Funnel, we like to apply a process called social nurturing on these types of leads. Social nurturing involves providing your recent “likes” with content that matters to them and giving these prospective customers more insight on your business. Using this philosophy, marketers provide content before utilizing advertising to try to make a sale. You may be wondering, “Why is this necessary?” or “Why not just show an ad to them directly?”. People do not go to Facebook to buy things. People go to Facebook to catch up on the lives of their friends and family. Right now, most people do not actively view Facebook as a marketplace to buy items or services. This distinction explains why the advertising efforts of many businesses on Facebook are unsuccessful. Which one of these two campaigns would you prefer? I’m guessing you picked Campaign 2. Now, which one of these audiences do you expect to convert at a higher rate? The more interactions and touchpoints that you have with someone, the more likely it is that that person will become a customer. By interacting more with a person, or just by making yourself seen more frequently, you are increasing trust in you as a brand, even if just on a subconscious level. It is safe to say that unless you make ads that are only for the desktop environment, the vast majority (up to 90%) of people clicking on your campaigns are going to come from a mobile device. Mobile traffic is the major source of Facebook advertising, so it is extremely important to make sure that your Facebook Page, website, landing page and other associated pages look amazing on mobile devices. 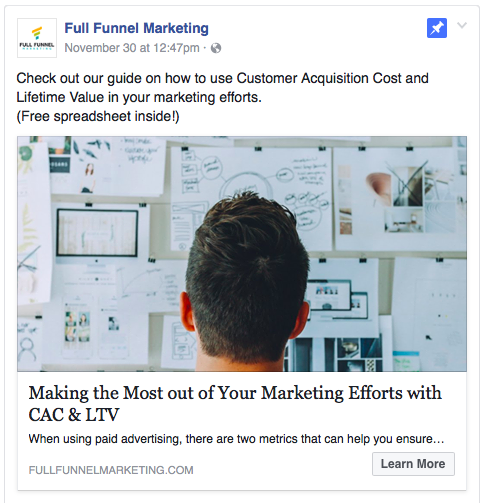 With the recent changes to Facebook Pages, many businesses haven’t optimized cover photos for mobile, and in turn this Facebook “welcome mat” is cropped in awkward or unintended ways when seen on mobile devices. A Like campaign won’t be successful unless you are targeting the right people. Just because a certain audience Likes your page at a cheaper cost per like doesn’t mean that these individuals will actually turn into customers. It is always better to pay more for a “quality” Like or a Like that can turn into a customer than to get cheap likes from people who will never buy from you. Use special offers and promotions as a part of your Like Campaign ads to incentivize Facebook users to “Like” your Page. People won’t just “Like” your Page out of the goodness of their hearts. Give them a reason to do it, and your likes will grow at a much faster rate. Follow up the offer on your Like campaign with a pinned post that leads people to your website, a landing page or lead magnet. Before or after Liking a Page, people tend to go to your Page to take a look at your existing content. Make sure that these visitors see what you want them to see first and make sure that visitors see that you are constantly posting updates. People won’t “Like” your Page if there is no activity. Just think about it: you wouldn’t subscribe to something with no content, so why would you expect other people to? Sometimes a “Call Now” button is not the best fit for some businesses. It may be more appropriate to invite visitors to go to your website or send you a message than to have a call to action which results in zero calls to book an appointment. Although a “Call Now” button sounds great in theory, most people aren’t ready to take that leap on their first visit. Test different button language and use the information you learn to adjust accordingly. Now that you have these five tips on how to run a successful Facebook Like Campaign, use them in your next campaign to maximize the ROI of your new likes! Need help developing a Like Campaign Strategy?